I got onto the bus on the morning of the race with butterflies in my stomach. I’d felt like the nervous anticipation that always goes with racing had been getting weaker in the World Cup and World Championship races over the last couple of seasons. Now it was back in full force! Once I was at the track my warm up was planned to the minute, each run down the track starts at two minute intervals, so I knew exactly when I would be setting off down the hill. Once I’d got going with my warm up the familiarity of that routine helped to get my mind focussed on what I needed to do for those 50 seconds down the track. We use imagery to help to prepare for each run, but before a race I use it more to get into the right state of mind rather than preparing details of how to drive down the track. Despite all the nervous energy I had, I felt like I was infinitely more relaxed than our support staff before each of my runs. After my warm up I got my spikes and suit on and waited to walk down the stairs when I heard our starts coach croak out his two minute alert. I enjoyed feeling that extra nervous energy as I stood on the start block; I knew that the extra energy and anticipation would help me to be sharper. Soon it was time to go and I looked down the track, put my helmet on and grinned. Then I was gone. The first run was a little off compared to my training runs, I was a little too tight and trying a little too hard to hit my lines. As a result it wasn’t a very fast run. But it put me in the mix. My second run, in contrast, was probably one of the most peaceful times I’ve had in recent years. It may seem counterintuitive for a frenetic 80mph rollercoaster ride on your face, but once I got on the sled all I felt was a calmness and confidence that made the run feel flowing and peaceful. On the next day the third race run was a carbon copy of the second, and suddenly I’d moved up to the bronze medal position before our final run. Centring my mind took a little longer in the preparation for that final run, but once I was on the block I was ready again. Excited and energised. And the run went well all the way down to corner 9, then a small mistake in 9 cost me some time. The flow was interrupted and two more mistakes in the final corners compounded the loss from that mistake. All we can see whilst whizzing up the outrun is a brief flash of the timing board, and all it showed was a number two. I was behind Nikita, the Russian athlete, and because of my mistakes I assumed that the gap had opened out to a couple of tenths. The disappointment was crushing. 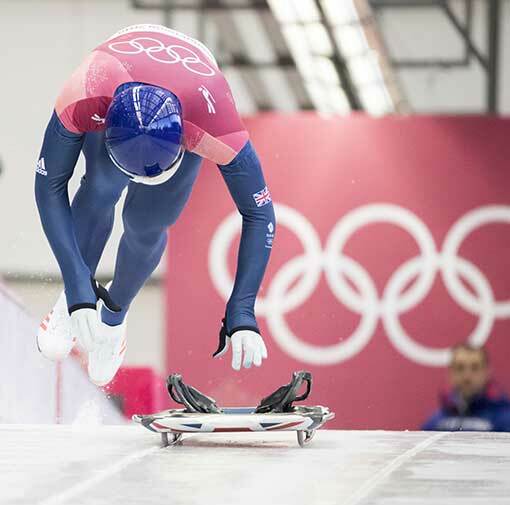 The next athlete down the hill was Martins Dukurs, serial World Championship winner, double Olympic silver medalist – the most successful athlete of all time in skeleton. I wasn’t paying much attention to the race any more, but then Nikita started getting louder. I looked at the screen in front of us and saw a third rank next to Martins’ name. But he was only a tenth or so behind Nikita. Wasn’t I further back? Nikita speaks all the English of a Labrador puppy, but with less enthusiasm and tail-wagging. So our conversation after that run was awkward, but he finally convinced me that if Sungbin came down first (which was guaranteed about as much as the sun rising each morning) then I’d won a bronze medal. I didn’t jump about, I didn’t really know what to feel. All those years of working my arse off – staying overtime at the track to take in details in the ice and replay runs in my head – studying videos of each athlete sliding for hours on end each day – going over sled setup details with Kristan and analysing data from each run – had been in the single-minded pursuit of a medal. My final run had had errors that I shouldn’t have made, and I still felt a tinge of disappointment in that. But I had won an Olympic medal, it didn’t seem real.